Being the unabashed hispanophile that I am, I naturally love a good sangría. This White Peach Sangría may not look too much like blood, but it's hard to beat on a warm summer night. 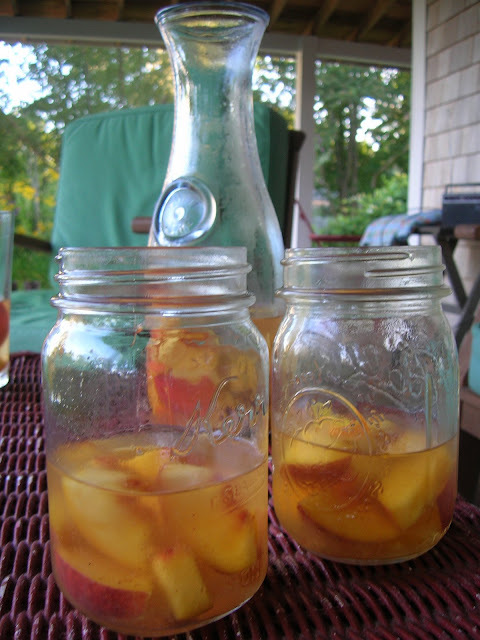 If you let it hang out for a while the peaches infuse the wine and soak up a little kick themselves. * I normally dislike chardonnay (tastes too much like the bottom of a barrel) but it's all we had in the house so, never turning down free wine, I added a few teaspoons of sugar to sweeten it up and it turned out to be delicious! If you use a sweeter wine you may want to forgo the sugar.